From the options which appear, select 'Internet options...'. Alternatively you can press 'Ctrl' and '+' to increase the text size, 'Ctrl' and ' - ' to decrease the text size. 'Ctrl' and ' 0 ' returns you to the default 'normal' size. Open the ' Tools ' menu with the mouse or press ' Alt ' + ' T '. Click on ' Options', or press ' O ' , to open the Options dialog box. Click the ' Content ' tab or use the arrow keys until it is highlighted (in blue). Click on ' Minimum font size ' box or press 'Alt '+ 'O ' . 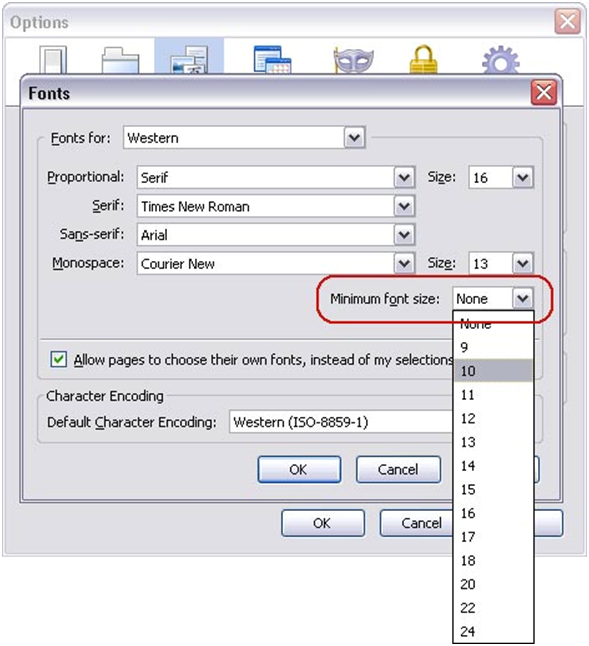 Use the up and down arrows to select a new font size and press ' Enter' - see Fig 2 below. Click ' OK ' button or press ' Enter '. Click ' OK ' button or tab to ' OK ' button and press ' Enter‘. 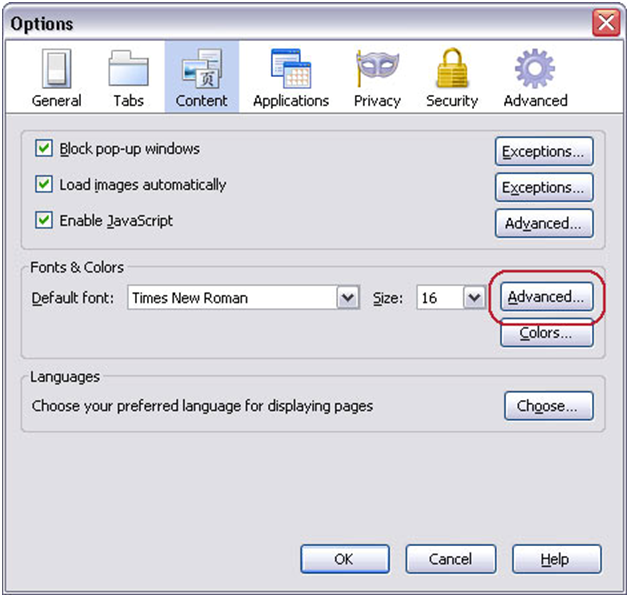 Open the ' Page ' menu with the mouse or by pressing ' Alt'+'P '. 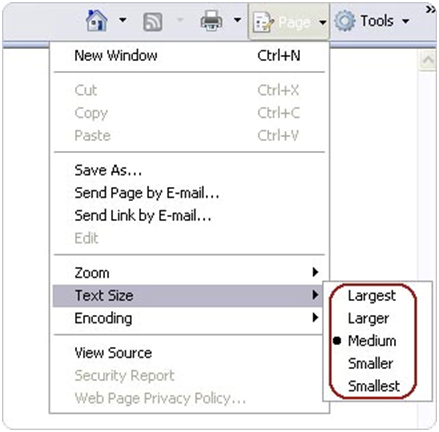 Select the ' Text Size ' option with the mouse or by pressing ' X '. See Fig 1. Choose your preferred text size by clicking on it or by using the up and down arrow keys to select it and then press ' Enter‘. Click on the ' Tools ' menu with the mouse or press ' Alt '+' O '. Click on ' Internet Options ' option with the mouse or press ' O ' . You should now see the ' Internet Options ' box as shown in Fig 2 below. 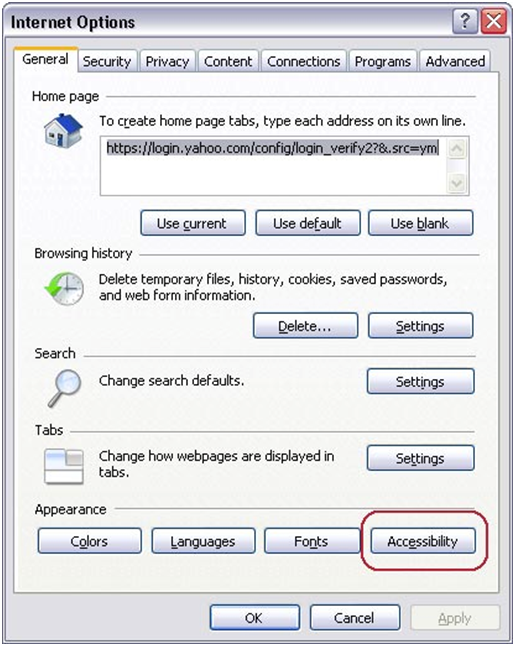 Click on the ' Accessibility ' button which is highlighted with a red circle in Fig 2 with the mouse or press ' Alt '+ ' E '. 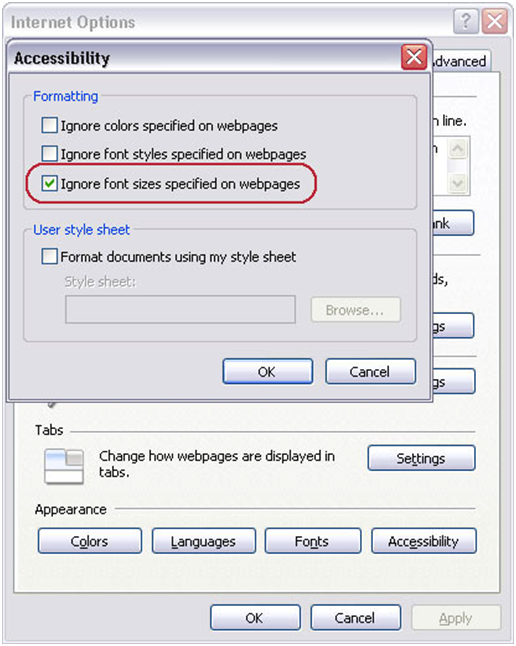 In the Accessibility box click the ' Ignore font sizes specified on web page ' checkbox to add a tick or press ' Alt '+' Z ' as shown in Fig 3. Click the ' OK ' button to return to the Internet Options box. Click on the ' OK ' button, or press ' Tab ' until ' OK ' is selected and then press ' Enter ' to return to Internet Explorer. press the + key to increase the size of the text and images or press the '-' key to decrease the size of the text and images. Keep repeating Step 2 until you reach the desired size. You can return to the standard size by pressing CTRL + '0'.